Erick Lemus/Courier The sign for the MESA classroom at Pasadena City College on Wednesday, September 27, 2017. Following the Board of Trustees’ (BOT) decision to accept a grant awarded to Pasadena City College, the college was given an estimated $70,250 for 2017-2018 which will fund the Mathematics, Engineering, Science Achievement (MESA) program, a STEM-driven group that focuses on disadvantaged students and their needs. With the recent approval, the funds will be used to offer support services to more than 300 financially disadvantaged and first-generation students, according to the BOT. When it comes to offering guidance, students can be found at her office hours discussing about school work or other events in their life. Her door is filled with decorative images of her family and friends, offering a welcoming atmosphere. Erick Lemus/Courier A mural in the MESA classroom that signifies the STEM field at Pasadena City College on Wednesday, September 27, 2017. With many services such as tutoring, mentoring, networking, access to computers, laptops, and workshops on college success, students in the program are given the tools needed to succeed—whether it be receiving help in their rigorous classes or tips on transferring to a four-year university. Not only does the program offer academic needs, there are other benefits ranging from various student activities and book loans. 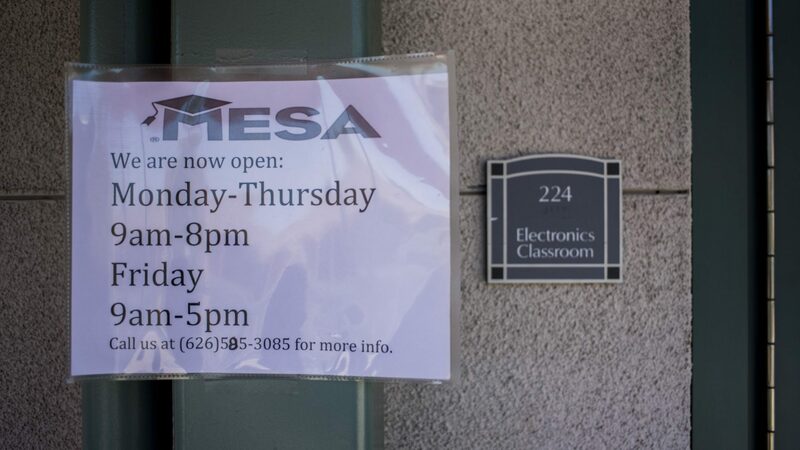 MESA also celebrates their students’ commitment to the program, as the program requires students to volunteer, attend workshops, and meet with their assigned counselors. In 1970, the science-focused program was originally established back for high school students. The program extended its services to community college students, and PCC followed suit by establishing MESA in 1991, which has grown significantly over the past years. Applications for MESA are open every year during August. Students applying late, however, can still submit an application and join at a later time.